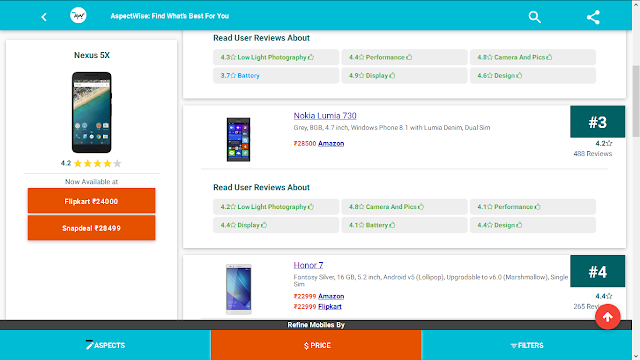 Aspectwise Review - Your Tech Shopping Simplified. Our world is perpetually taking a radical shift towards Online Shopping, which without a doubt is understandable. If everything is up and ready in front of our fingertips, why to go outside and waste our time, Right?. That's why while buying something online, some of us always need advice whether the specified product might serve our thoughts correctly. Which mostly would be done by taking our friends into consideration, Geeks I feel you. So heading a step into that direction, Aspectwise is an online shopping portal which serves as a platform to help understand & segregate things easily. Aspectwise will help you choose the perfect gadget sitting right in your expectations. How does that happen? Let's find out in our full review of the Aspectwise Platform. So Aspectwise is an online shopping portal gravitated towards gadgets. They help you select the perfect Smartphone/Gadget depending upon your personal preferences. This happens by comparing the products via different aspects and based on ratings. Aspectwise has their own AI running at its core to keep things organized. Let's say you prefer design as a primary factor while buying a new smartphone, then just select that and you're recommended with the required choices at your preferred budget. Aspectwise provides you with the best from both world's; you're also given negative points, which is straight away, awesome. So you can be assured that there are no strings attached, while buying any Gadget. Let's say you're about to buy a new pair of headphones & your primary concern is that you're all about that Heavy Base/Bass, but you're stuck with a limited budget. So what Aspectwise does is, It helps in segregating all the required headphones having the primary factor of base effect and low cost. You're also greeted with opinions from real users of that same product. Isn't this what we do while buying a product? 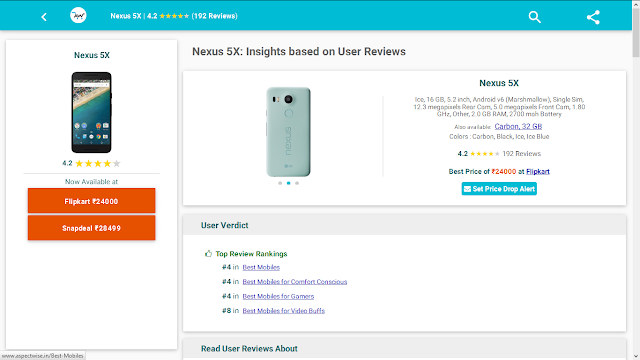 We always head to Google for finding the particular product review before buying it. Which is why you are right now reading my blog post, because before trying Aspectwise you wanted to know how the website is, Isn't it?. If you just nodded, Yes you got that. 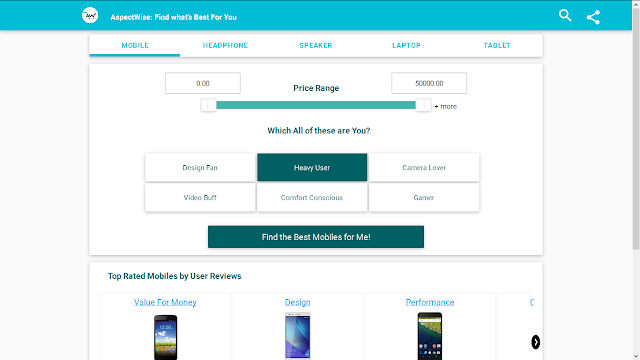 AspectWise not only helps you to find the perfect gadget depending upon your choice, but it also gives you an overview of how it would be priced on the major e-commerce websites in India like Amazon, Flipkart, Snapdeal, etc. Head over to your Gadget preference. Eg: Headphones, Mobiles, Laptops, Tablets, etc. Next, you're allowed to select various categories .that your device falls in. Viz. For a Smartphone - Design, Heavy User, Camera Lover, Gamer, etc. Then tap, find best mobiles(in my case) for me & that's it. Best Mobiles for Low Light Photography. So likewise I followed the same steps mentioned above, as I was searching for a phone which could produce some significant snaps in low lighting conditions. So I searched for the term "Best Mobiles for Low Light Photography." & I was greeted with several options, but the thing that catches my eye and was fitting in my budget was Nexus 5X. The Nexus 5X was ranked one of the best phones for low light photography from the reviews in Top rankings. At first, I thought, hey that's just similar to the filters on various other websites. But then when I compared few of them with Aspectwise, I realized that what Aspectwise provides is appreciable. As it is modifying the harsh complicated technical terms into plain language for an average consumer. So let's see how Aspectwise performs standing in the startup league with it's AI that helps users to make their desired choice. Also See: Brainwavz BLU-200 Bluetooth Earphones Review - Worth every fare.